Anyone who has ever been curious about the day-to-day operations of a construction company working on a massive office building now needs only to check out the Bolshoi Dom video project. 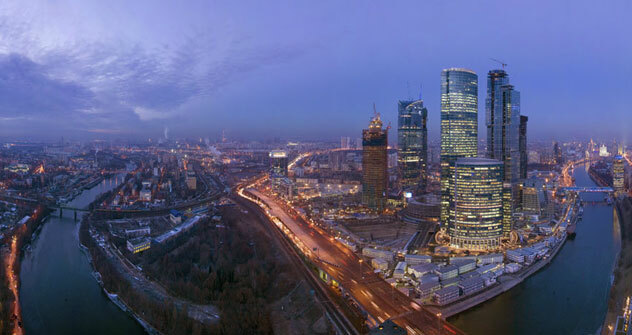 In 2003, construction began on the Federation Tower, a skyscraper in the Moscow-City financial district that will someday be the tallest building in Europe. When construction began, the contractor for the project was Mirax Group, a development company headed by Sergei Polonsky, one of Russia’s most controversial businessmen. The firm was shaken by the 2008 global financial crisis in 2008, and many feared the tower would never be completed; on March 3, 2011, Mirax Group ceased to exist altogether. But on Nov. 11, 2011, a new phase in the story of the Federation Tower began. On Polonsky’s advice, a fly-on-the wall documentary was launched called “Bolshoi Dom” (“Big House”). In the show, the work of the company and the construction of the tower are captured on film and made accessible to the general public. Soon after this, the company itself was restructured and renamed Potok8, also known as Stream Infinity. Height of the spire – 1,660 feet. Dvorkovich recently sat down with Russia Beyond the Headlines’ Anisiya Boroznova to discuss the unique project and the company behind it. Russia & India Report: What does the project set out to do? Mikhail Dvorkovich: In today’s world, everything changes very quickly. The amount of information we have can double in the blink of an eye. When everything around is happening at top speed it is tempting for people to stop taking responsibility for what they are doing. We decided to adopt a novel approach to try and regain control over what was happening: we started filming everything. By uploading these video clips on to the internet where everyone can see them, we make it hard for people to pull the wool over our eyes; on camera there is no doubt about who is responsible for what. If there is photographic evidence of an agreement being closed – two people are filmed discussing and agreeing to the terms and conditions – and if we put this video on our website or in an archive, it’s then impossible for the people to argue that this agreement never happened. Of course, at first it wasn’t easy for people to be constantly under surveillance, so the company set up a medical center, where staff could take a break from the cameras and look after their physical and mental health. But not one of our employees has resigned because of our new approach to management. Now everything is business as usual, people just carry on working, and I think they are quite interested in our project. Recently the workers themselves have become involved in the filming process; it is not just the cameramen who do it. People have started to live and work in a completely different way. With this project, we’ve managed to kill two birds with one stone, and this doesn’t happen very often in our business. Firstly, we have really increased the efficiency of the workforce. Secondly, we have ensured absolute transparency in everything the company does. I don’t think any other company in the world would be able to match this level of transparency. It’s impossible to accuse us of anything, because we can prove anyone wrong. Thirdly, I really believe that we have created a business model for other companies. Thanks to the video, anyone working in the construction sector can see exactly what goes on in our company. In our video archives there is something for everyone: sales, marketing, construction, design, finance, HR – it’s all there. RIR: Tell me a bit more about your work as the director of the video project. M.D. : It’s quite a difficult job. You have to make sure the video doesn’t get in the way of the task in hand. It’s important to remember that the video is not the main thing here. It’s not a reality TV show, we’re not out to entertain or make money from what we film, and we are generally dealing with quite serious subjects. We are building a construction that will be the only one of its kind in Europe. We take our task very seriously. We employ 20 cameramen and five film editors, there are 500 people working in the back office, and if you include all the builders working on-site, we’re talking several thousand people. Therefore, our main task is to coordinate the operation so that everyone, in all departments, can successfully work together towards a common goal. RIR: What was your reaction when Polonsky closed the Mirax brand and declared that he was no longer a businessman? M.D. : What Polonsky does is not really business, it is art. At the end of the day he is just a man, but he has a controlling stake in the company and plays an active role in the life of the firm. He has promised that he will finish building all these projects and pass all the flats and offices over to our co-investors. He is going to restructure all our debts, and has said that he’s not going anywhere until he has done this. RIR: Have there been any other big changes in the company apart from the Bolshoi Dom video project? M.D. : We have banned suits in our office. When someone is wearing a suit, they somehow stop thinking outside the box: in suits, everyone looks the same. And as soon as our employees take off their suits, they turn into different people. If people can wear what they like to work, they feel at ease, just as if they were in their own living room, and they can express their individuality. Our employees practice qigong. This isn’t an obligatory thing; they do it voluntarily. At first only a few people turned up to the sessions, but then, seeing that it did people a lot of good, that those who did qigong were happier and calmer, other people also started to join in. Now, nearly everyone goes. At Stream Infinity we allow our staff to move between departments as much as they like. If they want to transfer to another role, they have to make a short video in which they explain the reasons for their change, what they think they’d bring to the new position, why they want to leave their previous role, and so on. A video is completely different from a written statement – writing cannot show the emotional dimension, and without emotion, a person can never do anything worthwhile. But this doesn’t mean that we didn’t bring in a lot of innovations before the crisis, when we were working under the previous management system, it’s just that in the past these changes weren’t so visible. Now all our initiatives are plain to see. There is not just one person in charge of every project – we employ three. Why? Because two people will always have different points of view, but a group of three can always come to an agreement, as there will be a majority in favor of one option. Three-sided management is always the best way forward. In our company there is no such thing as a command. They have been outlawed. People have to explain their point of view to a colleague if they want to ask for their help. We have a collective consciousness at play in the office, everyone is encouraged to contribute and actively develop an idea. In all, our company has a unique dynamic, there’s a good atmosphere here, and you’d be hard pressed to find another company, where the employees communicate so freely. The construction of the Federation Tower, a skyscraper in the Moscow-City financial district. Source: Youtube/nazvanienet.